The inspiration for my Potato Leek Soup came from my dear friend Kelly, a 10 time Ironman and 2 time 50 mile endurance runner. This courageous woman is battling leukemia for the second time. 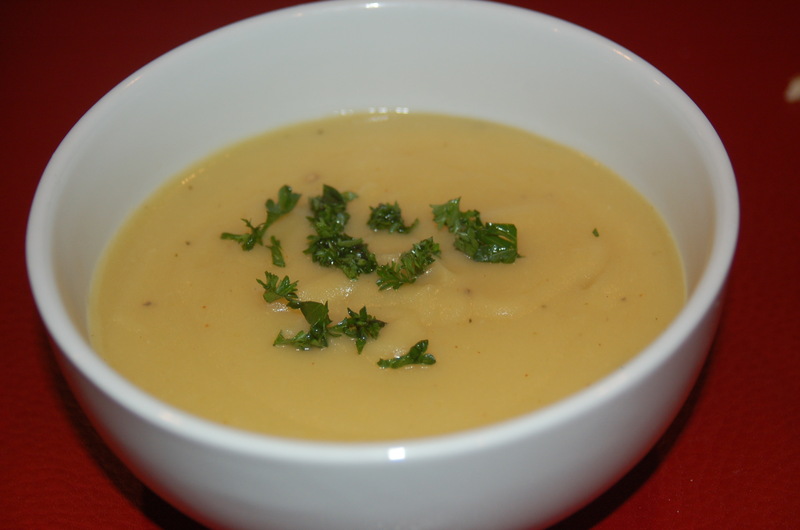 While undergoing chemotherapy, Kelly requested potato leek soup made without cream for lunch. The potato leek soup also served as a nutritious and tasty breakfast prior to a long run or trail race, where I am running anywhere from 3 to over 6 hours. Chicken Rice Soup and Potato Leek Soup are now my two favorite early morning meals to help fuel my long workouts. Both also provide potassium. I usually consume half a bagel or some oatmeal in addition to the soup. Some races offer broth on the course or soup at the end of the race. At the finish of this weekend’s trail race, I grabbed warm soup and chased it down with low-fat chocolate milk. Since I often cannot tolerate solid food immediately after an endurance event, I find that calories in liquid form are the easiest way to get nutrition down. I personally prefer real food over “recovery” drinks. Remember, it’s important to consume calories within 20 minutes of your workout. 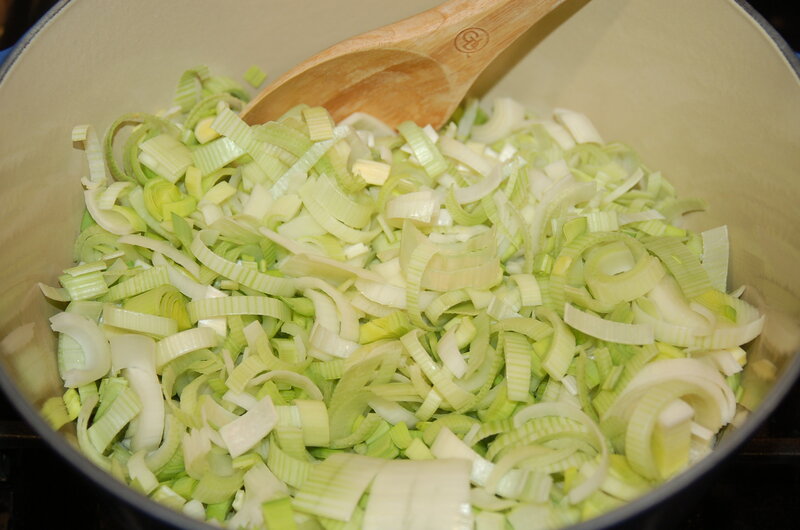 In a Dutch oven or stock pot, sauté the leeks in olive oil for 8 minutes until the leeks are softened but not brown. Add chopped garlic, thyme, potatoes and broth. Bring to a boil and let simmer for 20 minutes or until the potatoes are tender. If using a hand held immersion blender, puree soup until smooth with no lumps. Be careful. The soup will be very hot. 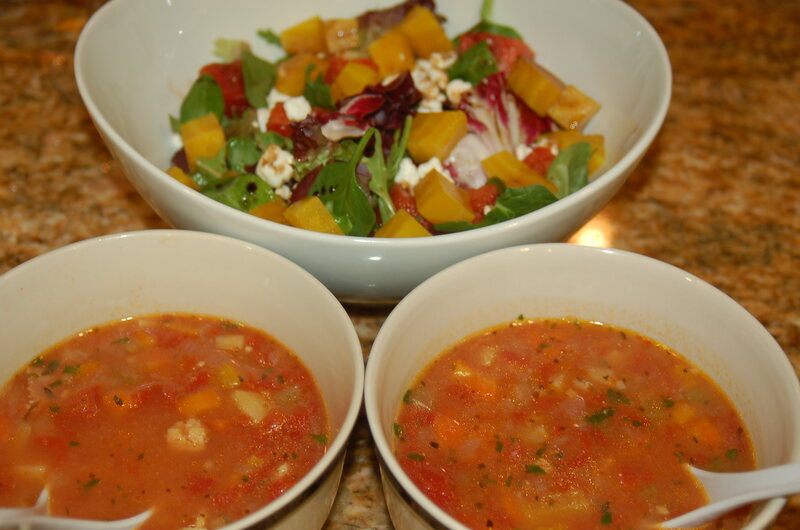 If using a regular blend, allow soup to cool down before pouring into blender. 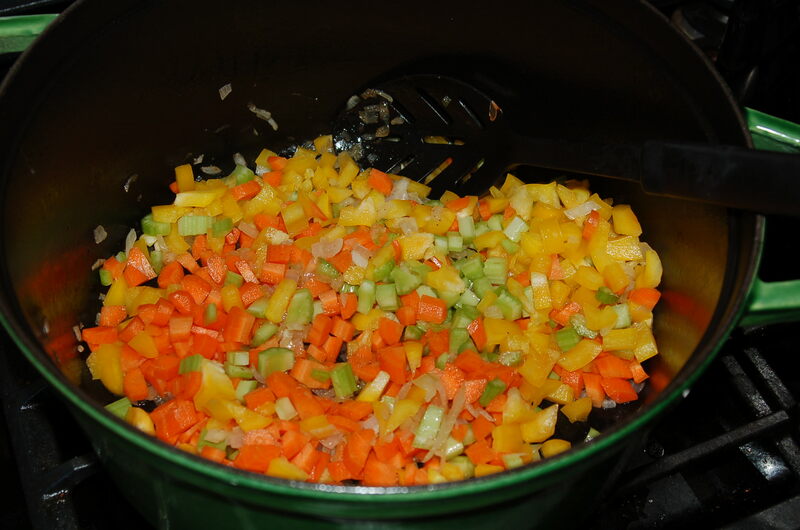 Once in the blender, puree soup in small batches, using a towel to cover the lid in case the hot mixture escapes. Add additional broth to obtain the desired consistency. I prefer it to be a little creamy and loose enough to drink out of a mug. Stir in chili powder and salt to taste. It’s important to add a bit at a time and keep tasting. You can always add more but you can’t take it back out. Garnish with chopped fresh parsley or croutons. Add additional broth to soup if it becomes too thick when re-heating. 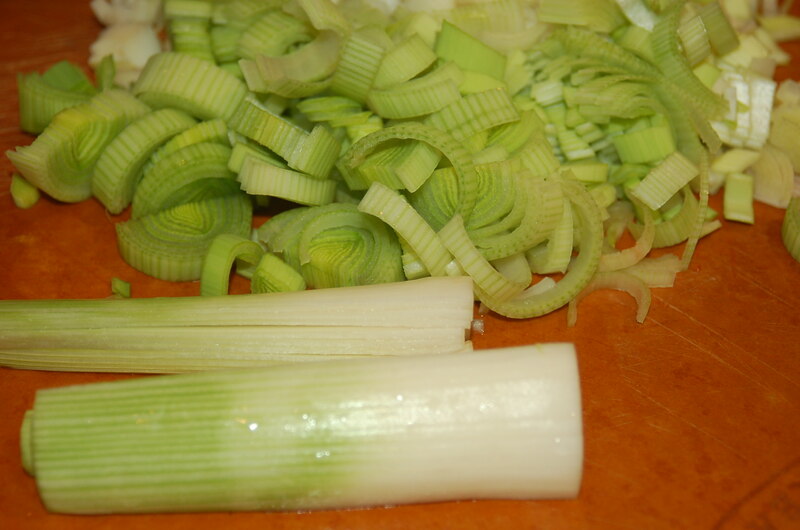 Use the white and pale green parts of the leek. Cut the stalk in half length-wise and rise out the layers. I prefer to remove the outer tougher layer. Then slice. When re-heating, you can add additional broth to thin out the soup if it gets too thick. 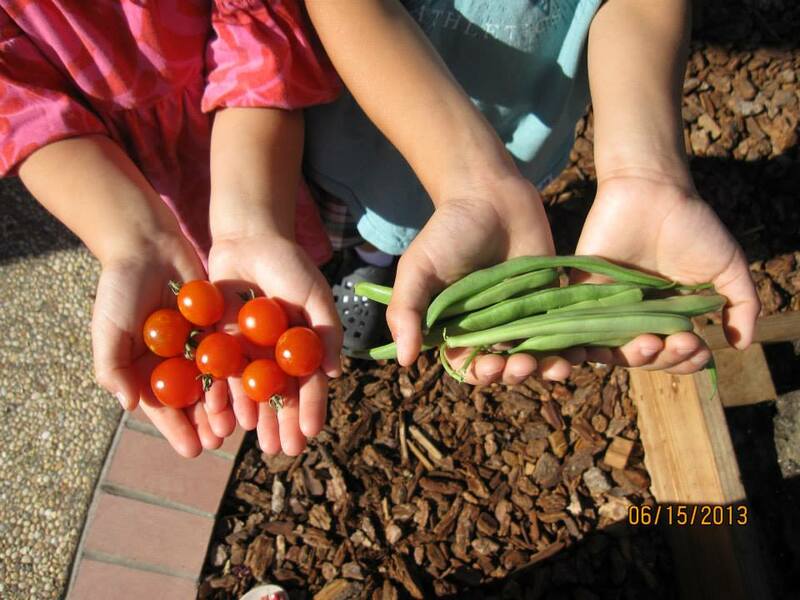 A great way to encourage children to enjoy eating vegetables is to teach them how to grow their own garden. 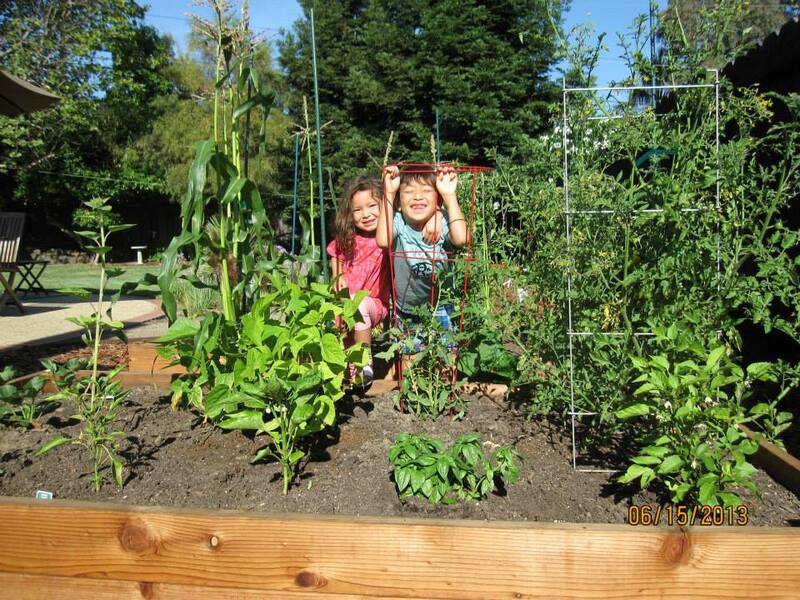 Chloe’s and Zachary’s parents built two garden boxes in their back yard, one for each child. The children planted their first garden in the Spring, watered it diligently and watched with excitement, their garden grow before their eyes. 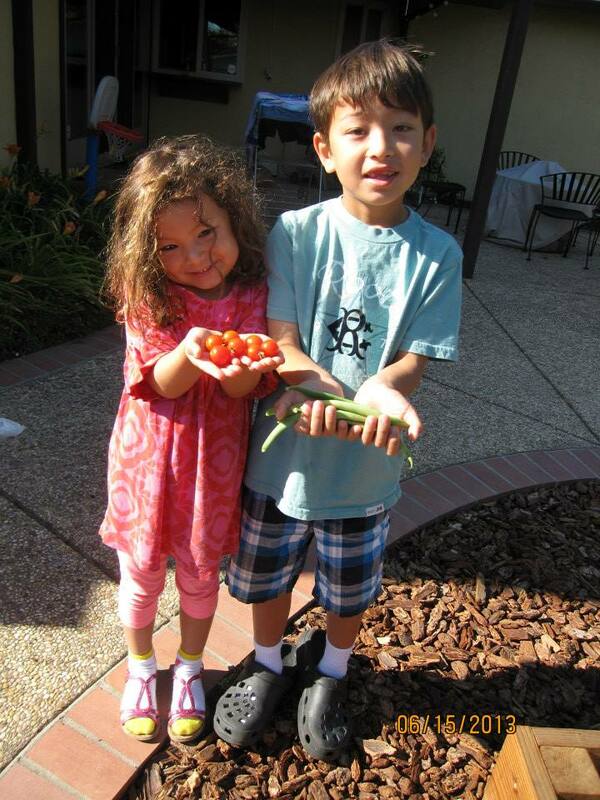 They were recently rewarded with strawberries, corn, tomatoes, cucumbers and string beans. Innocently unbiased and ferociously inquisitive, Chloe and Zachary will ask to taste all the ingredients in its raw form no matter what it is. When I cook with them, I guide them on what they should or should not try and am thrilled they are willing to try everything. What a wonderful way for the children to appreciate the true flavors of raw vegetables and understand how their flavors can change when cooked or seasoned. 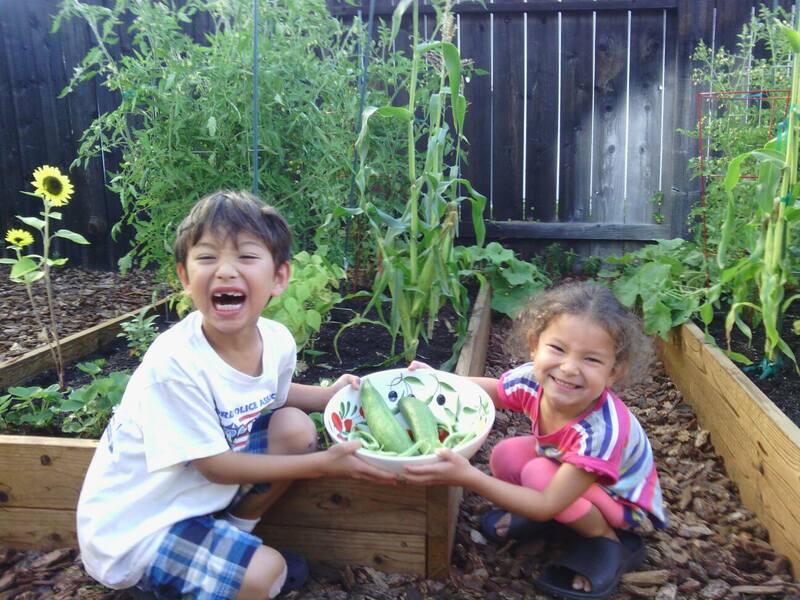 My Roasted Corn, String Beans, Tomato and Cucumber Orzo Salad was inspired by Chloe’s and Zachary’s garden. The vegetables in this recipe are either raw or lightly cooked so their freshness can be enjoyed. This salad can either be served as a side dish or as a vegetarian main course. Add chopped roasted chicken for a protein-rich main course. Cook orzo in boiling water for 8-9 minutes until barely tender. Drain and rinse in cold water. 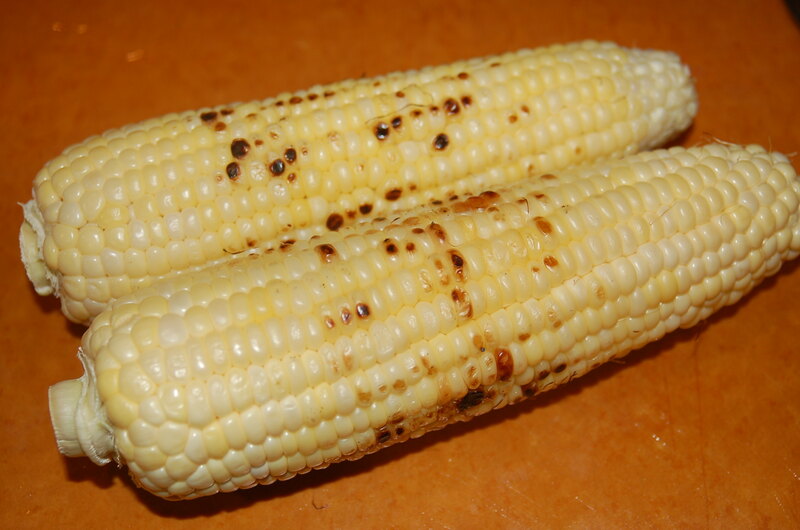 Husk corn and roast on grill until some of the kernels are evenly browned on all sides. Remove the corn kernels by holding each cob upright on it’s stem and carefully running a sharp knife down the cob over a large bowl. Add cooked orzo. Cut green beans into 2-3 inches. Blanch in boiling water for 2-3 minutes. Green beans should still have a crunch. Drain and place in ice water. Drain again and add to orzo and corn. Cut cucumber in half. Using a teaspoon, scoop out the seeds. 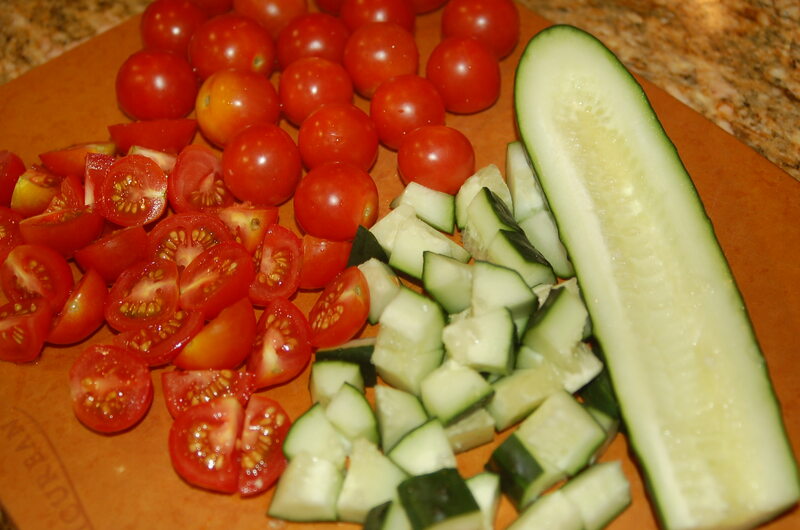 Cut the cucumber halves into thirds or quarters lengthwise. 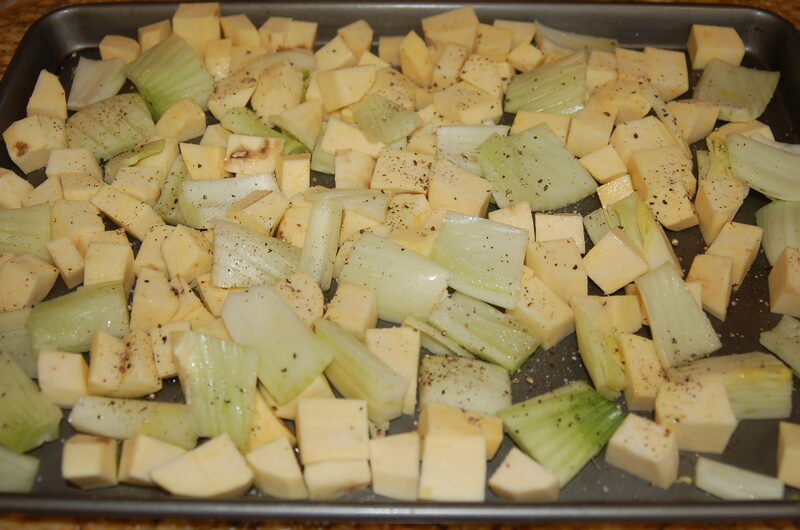 Then cut into ½ inch cubes. Cut cherry tomatoes in half or thirds depending on size. Add cucumber and tomatoes to orzo, corn and string beans. 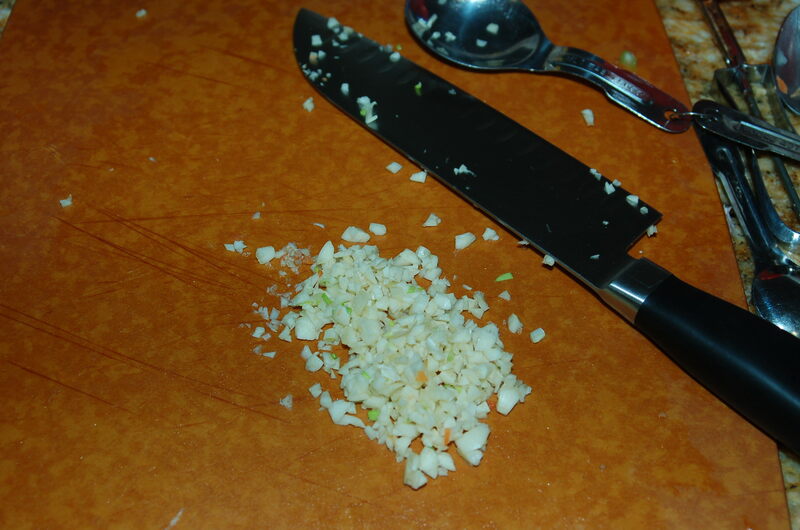 Rough chop parsley and add to orzo mixture. Whisk together olive oil, lemon juice and Dijon mustard. Add salt and pepper and whisk again. Pour over orzo and vegetables. Toss well. 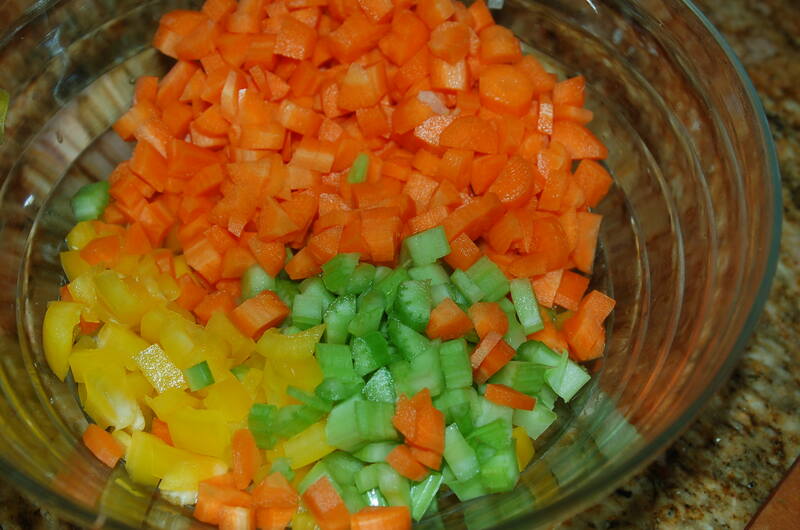 Allow the orzo salad to sit for at least 1 hour to absorb the flavors of the dressing. My Orange and Rosemary Roast Pork Tenderloin with Fennel and Sweet Potatoes is a protein-rich and nutritious meal, that is easy and quick to prepare for a weekday dinner but elegant enough to serve for Easter Sunday. 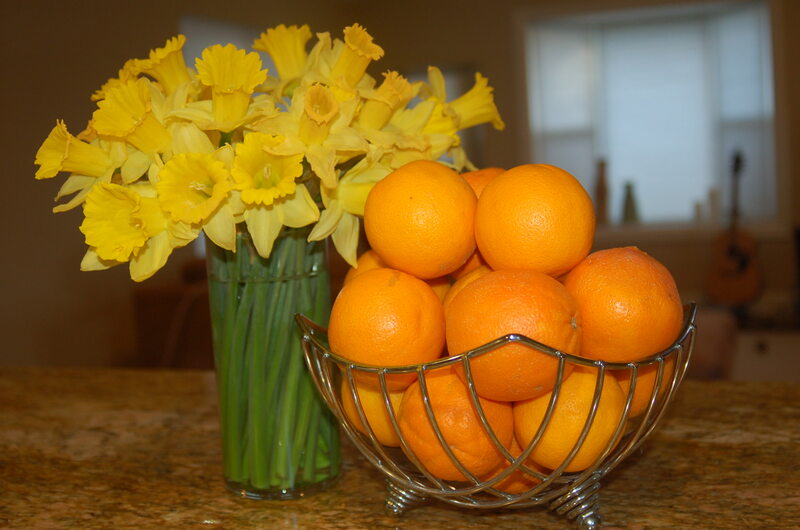 My inspiration were the sweet and juicy oranges I had in my Easter basket from my friends’ backyards. The other inspiration is that I needed to prepare a healthy meal for my triathlete friend who came for dinner and brought me these lovely daffodils. According to WebMD, pork tenderloin is nutrient-rich and about 31% leaner than 20 years ago. The pork tenderloin comes from the leanest part of the pig. It has very little saturated fat and is as lean as chicken breast. 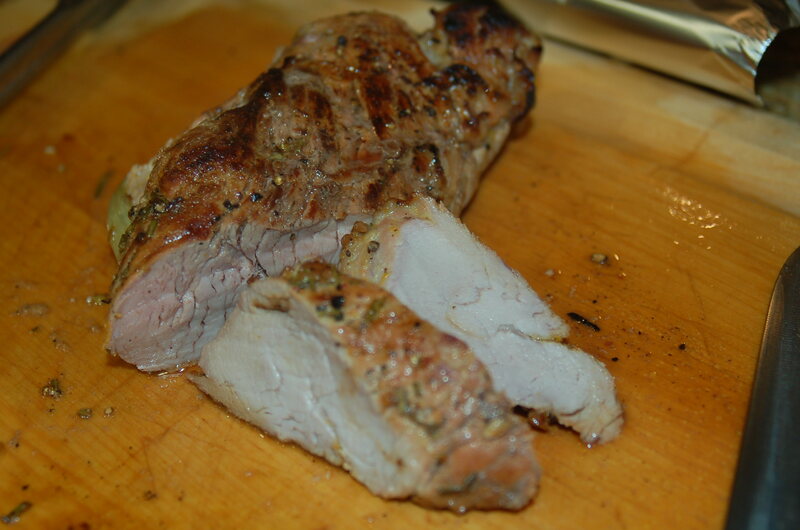 Because the pork tenderloin is lean, the meat can be dry if over-cooked. To avoid over-cooking, use a meat thermometer. 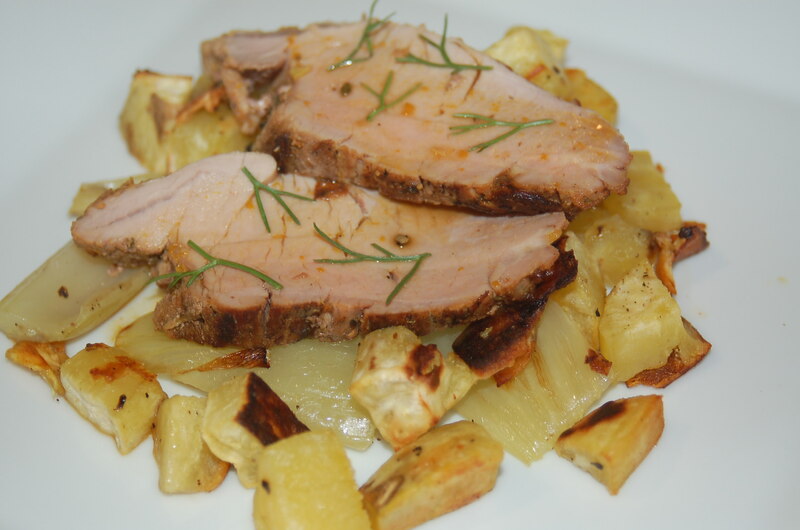 The sweetness of the roasted fennel and sweet potatoes compliments the flavors of the marinated pork tenderloin. I prepared this dish using both white and orange sweet potatoes. I prefer the orange sweet potatoes because it adds a nice color to the dish, but they are hard to find in my local food markets. Both white and orange sweet potatoes are “superfoods” rich in Vitamin A, Vitamin C, calcium and potassium. The white sweet potato is a little sweeter and the orange sweet potato is known to contain more beta-carotene. Yams are not the same as sweet potatoes and do not contain the same nutritional value. The white sweet potato has a softer and lighter skin in comparison to the orange sweet potato, which has a darker skin and harder texture. Marinade pork tenderloin overnight or for at least 4 hours. When you are ready to cook the pork tenderloin, preheat oven or grill to 400F. Prepare the marinade by whisking together orange zest, orange juice, soy sauce, garlic, rosemary, Dijon mustard and ground black pepper. Reserve ½ cup of the marinade and refrigerate. You will use this to make a sauce for the tenderloin later. Place remaining marinade and the pork tenderloin in a large leakproof and resealable bag. Marinade overnight or for at least 3 hours. Remove the tenderloins from the marinade and discard the marinade. 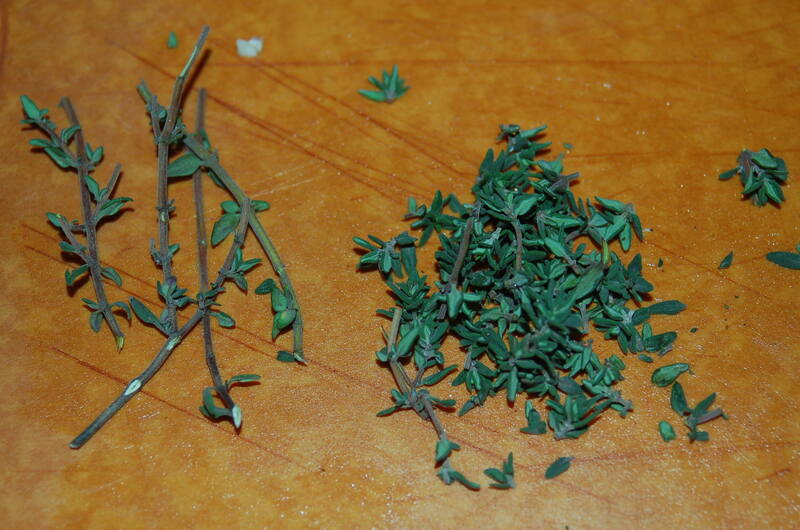 Leave the herbs that cling to the meat. Sprinkle the tenderloins with freshly ground black pepper. Set aside. Peel and cut sweet potatoes into 1 inch cubes. 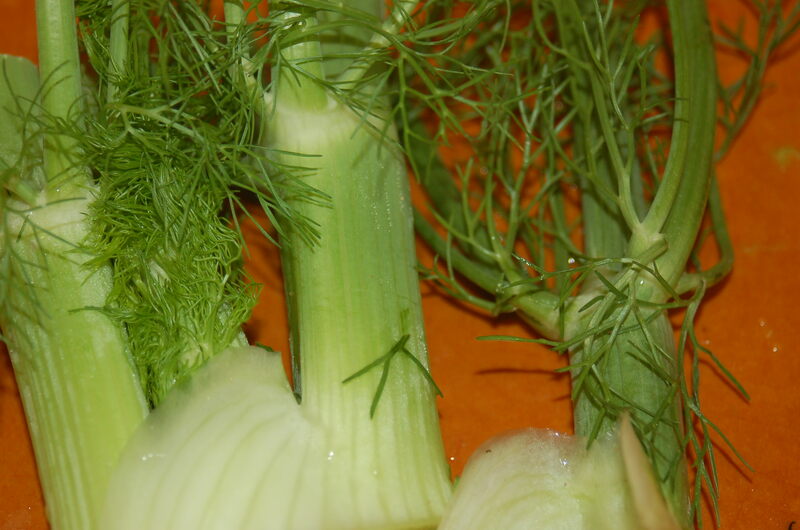 Cut fennel bulbs across in half then lengthwise into 1 inch quarters. Separate the layers. Toss the potatoes and fennel in 4 tablespoons olive oil. Season with salt and pepper. Place in large roasting pan. Roast for 25 minutes, tossing a couple times, until potatoes and fennel slightly brown and caramelized. Heat 2-3 tablespoons olive oil in a large sauté pan over medium-high heat. Sear the pork tenderloins on all sides until golden brown about 3 minutes on each side. Push the vegetables to the edges to make room for the pork tenderloin, but it is fine if the tenderloin lays on top of some of it. Roast the tenderloins for 10 to 15 minutes or until the meat registers 145F* at the thickest part. If necessary, the vegetables can be left to roast a few minutes longer once the pork tenderloin is removed. Heat reserved marinade with water in sauce pan. Bring to a boil then simmer for about 10 minutes until reduced slightly. Transfer the tenderloins to a platter and cover tightly with aluminum foil. Allow to rest for 10 minutes. 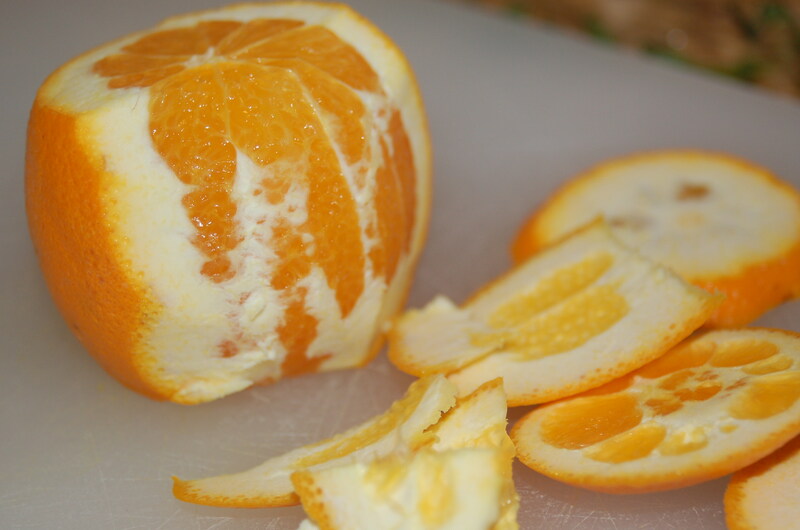 Carve in 1/2-inch-thick diagonal slices. The tenderloin will be a little pink, which I prefer. Serve on top of fennel and sweet potatoes. Spoon strained sauce over sliced pork. Garnish pork with fennel fronds (leaves). * Note: The USDA recommends cooking the pork tenderloin to an internal temperature of 145F. At this temperature, the pork tenderloin may be a little pink in the thickest part, which is completely fine. Allow the pork tenderloin to rest covered with aluminum foil for 10 minutes before slicing. The ends will be well done and the middle will be a little pink. Served with white sweet potatoes here. My Pasta with Fresh Spinach and Tomatoes was inspired by my dear friend Kelly. A cancer survivor, mom and 8 time Ironman triathlete, Kelly was a big inspiration at my most significant races: my first triathlon and my first Ironman triathlon. I had butterflies in my stomach at these two races. My mind was racing and rethinking everything (Do I have all my nutrition? How much time do I have before my wave starts? Did I lay out everything I need in transition?) 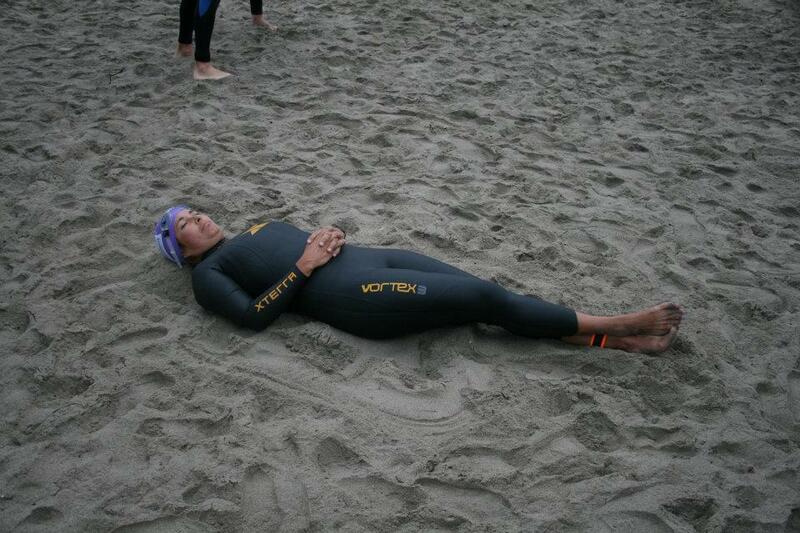 At my first triathlon, I spotted Kelly, laying on her back on the beach, in her wetsuit, with her legs crossed and her eyes closed. She looked so peaceful. I’ve got to learn how to relax like that before the start of a race! When it was time for us to start the race, Kelly offered to swim with me. You see, Kelly races for the pure enjoyment of racing. Of course I declined. I wanted her to race her own race, but I will always remember her selfless gesture. At my first Ironman, I was lucky to find Kelly before the start again. She was my security blanket as we walked out to the beach. Kelly then looked into my eyes and reminded me that “It’s just another training day.” Exactly what I needed to hear. This recipe is for Kelly. She asked for spinach and tomatoes with her pasta. * Note: Nutritionists recommend a single serving size of pasta be no more than ½ cup or the size of a hockey puck. This is much less than what is typically served at restaurants. I simply add lots of vegetables to my 1/2 cup of pasta. In addition, I eat a side salad with this meal. 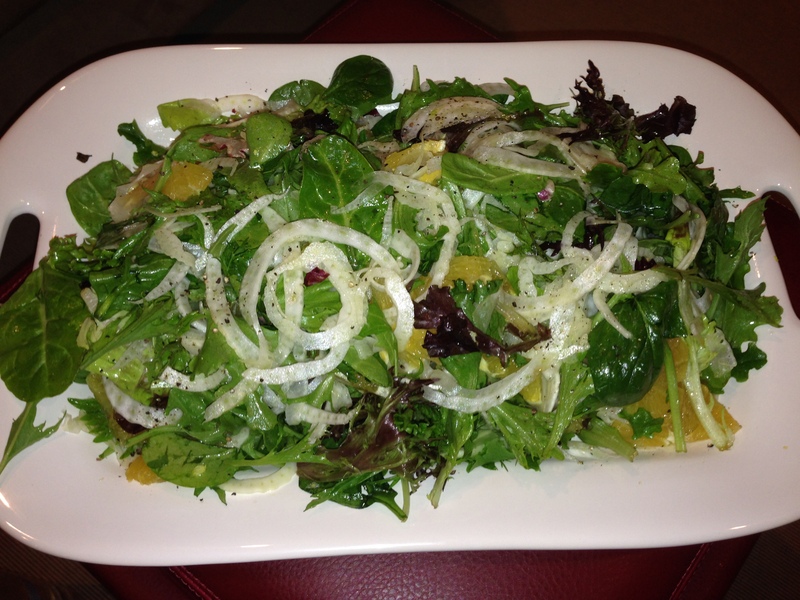 My Orange, Fennel and Arugula Salad or a simple tossed salad pairs nicely with this dish. Cook the pasta al dente according to the instructions on the package. While the pasta is cooking, heat olive oil in sauté pan over medium heat. Sauté garlic in the olive oil for about a minute, then add spinach leaves and tomatoes. Continue to sauté until the spinach wilts and the tomatoes starts to break down a little. Season with red pepper flakes, salt and freshly cracked black pepper. Add juice of half of a lemon and toss to combine. Add to cooked pasta. 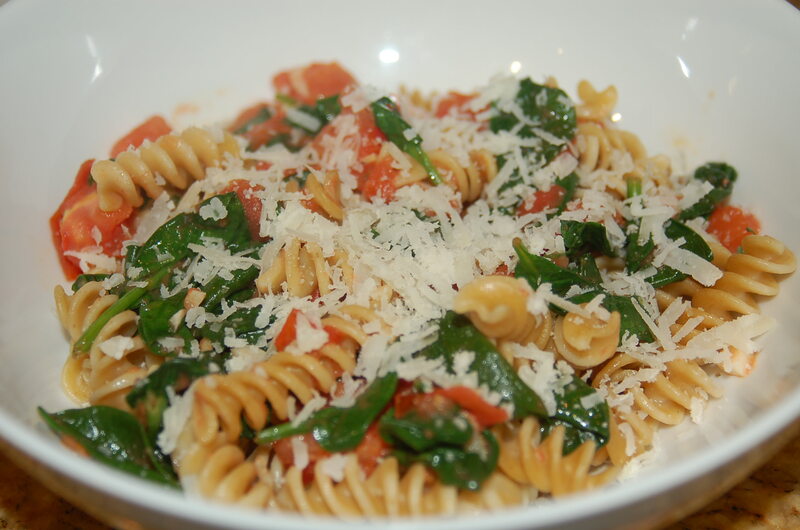 The pasta is flavorful as is however, grated Parmesan or Pecorino cheese can be added just before serving. Kelly and I, just before we walked onto the beach at Ironman Canada.